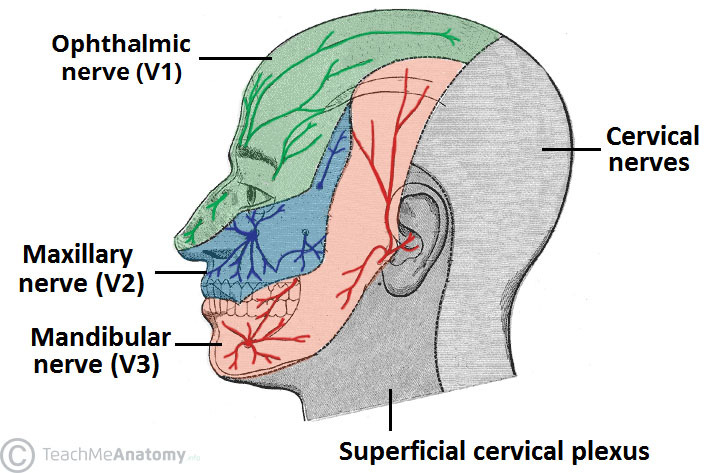 The ophthalmic nerve (CNV1) is a terminal branch of the trigeminal nerve (along with the maxillary and mandibular nerves). It provides sensory innervation to the skin, mucous membranes and sinuses of the upper face and scalp. 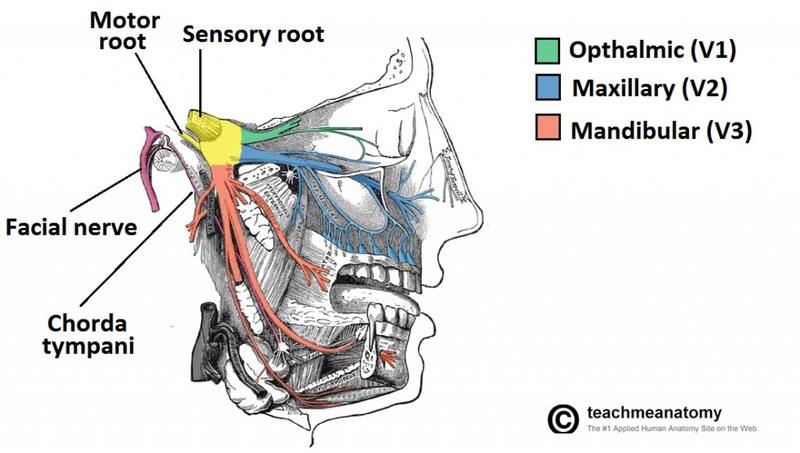 In this article, we will look at the anatomy of the ophthalmic nerve – its anatomical course, sensory functions and autonomic functions. 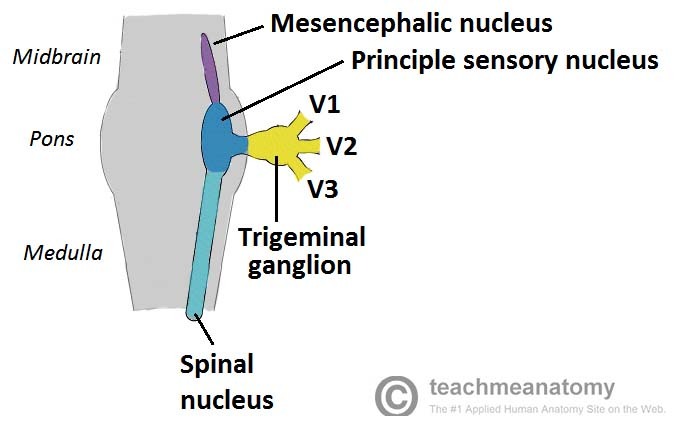 After arising from the trigeminal ganglion, the ophthalmic nerve travels laterally to the cavernous sinus and gives rise to the recurrent tentorial branch (which supplies the tentorium cerebelli). 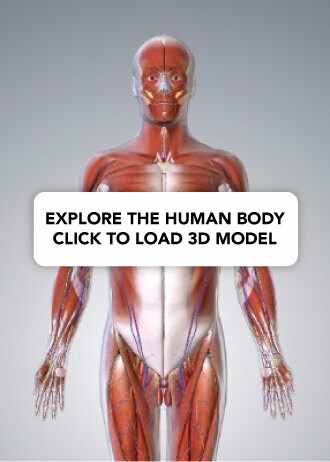 These three branches provide sensory innervation to the skin and mucous membranes of the structures derived from the frontonasal prominence. The table below outlines the structures innervated by branches of CNV1. Contains parasympathetic fibres to lacrimal gland. Nasociliary Anterior ethmoid nerve Sensory innervation of mucous membranes of frontal, ethmoid and sphenoid sinuses. Sympathetic fibres (from the superior cervical ganglion) hitchhike on branches of the nasociliary nerve (long ciliary nerves) to reach the dilator pupillae in the eye. 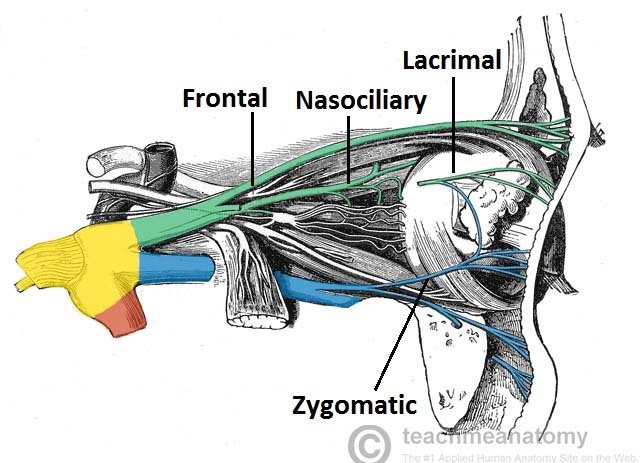 Parasympathetic fibres (from the pterygopalatine ganglion) hitchhike along the zygomatic branch of the maxillary nerve (CNV2) and then the lacrimal branch of the ophthalmic nerve (CNV1) to reach the lacrimal gland. The lacrimal branch itself provides sensory innervation to the lacrimal gland. If the corneal reflex is absent, it is a sign of damage to the trigeminal/ophthalmic nerve or the facial nerve. Fig 5 – The corneal reflex pathway. The branches of the ophthalmic nerve exit the cranium through which structure? Which of the following is not a branch of the ophthalmic nerve? Which is the largest terminal branch of the ophthalmic nerve?